After a nice visit to the 49N-17E is Czech Republic the previous day, we reached Bratislava, the capital of Slovakia and spend the evening and a good part of the morning there. As we were heading to Budapest, this point took us off the expressway for couple hours of pleasant country driving and break up the long drive. Our able GPS which has all the tiny roads in the memory brought us to within 280 meters from the point. A small trail pointed toward the point next to a barbed wire fence. We followed the trail until we found that the all-zeros spot was 6 meters at other side of the fence. So we back tracked to where we parked, and two of us went through a gate and reached the all-zeros spot. 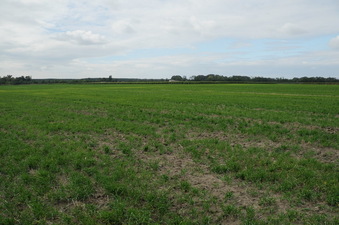 The field now newly planted with winter wheat, and other side of the fence were dried up corns yet to be harvested. This confluence point is located just slightly north of the border to Hungary. After the hunt, we had a nice picnic on the river bank of the Slovakia side.